Does your Body Know GMO Papayas Ms. Amato? Several months ago, I received a message from a Terez Amato in my Facebook message box. I’m not sure what she is referring to by “Thalidomide babies” and “flipper kids” and epidemiology. Quite a bizarre email indeed because I don’t know what Thalidomide has to do with papayas. Maybe she read it on some Natural News website and got that idea. 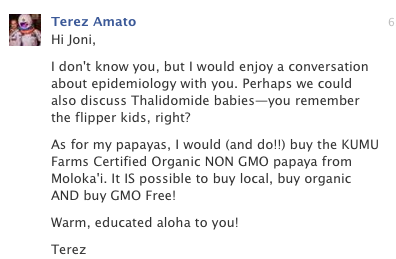 When I read this, I got the impressions that she was kind of bragging that she buys non-GMO certified organic papayas. I suspect that she must not know that most of the non-GMO stuff is already virus infected. Nature actually GMO’d these fruits already. Little does she know that she is actually eating more virus particles in her fruit than she would in a transgenic GMO one. Of course, your body can’t tell the difference either way. Only an anti-GMO activist would be freaked out to know this. Our stomach’s hydrochloric acid and enzymes would destroy those DNA molecules up like nothing and we wouldn’t know the difference. I did write her back to ask her about her expertise on this issue and she didn’t reply to me. It would be interesting to learn where she read about this because I can’t seem to find how the two issues are related. It’s also interesting to note that she is running as a Senator for the Hawaii Legislature. Good to know where she stands on the issues. This entry was posted in The Anti-Science Debacle and tagged GMO Free Hawaii, GMO Free Kauai. Bookmark the permalink. ← Just Because You’re Mad… Don’t Take it Out an Everyone!